Behavior: at sunset the barking gecko cries and they are quiteslow. Diet: Crickets ,roache s,waxworms ,silkworms , and mealworms. Housing: Barking geckos use bark or soil as a substrate. also you can have moss to keep up the humididty f it is sprayed often. Also like all Geckos they like to hide. INFO: The Barking Geckos are from South Africa originally. they live in the woodlands andbushes next to Kalahari. Tey get to about 12cm in size. 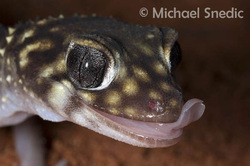 In the wild Barking Geckos eat termites, small Coleptera and hymentopters.